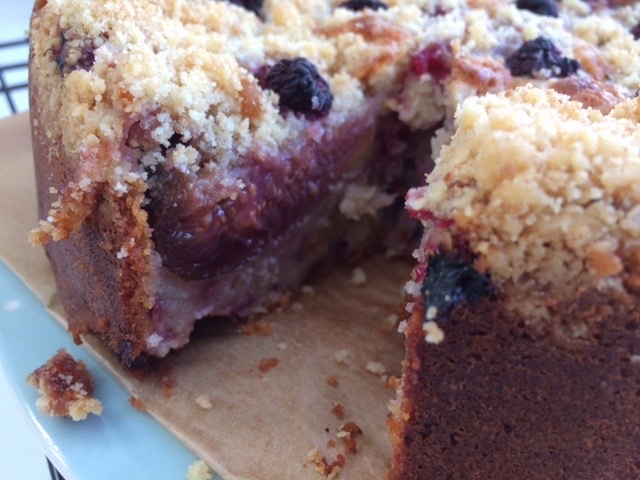 If you ever find yourself in the happy situation of having several large fresh figs and a bowl of raspberries, I strongly urge you to make a Fig and Raspberry Crumble Cake. My neighbour has a large fig tree which has produced masses of exquisite figs this year and she kindly gave us a load. 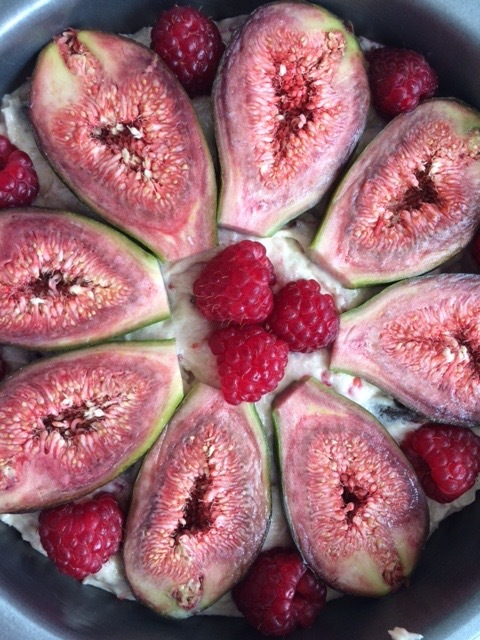 As there are only so many raw figs one can eat, I searched for a recipe and found this one from the fabulous cookery writer Diana Henry. I altered it only very slightly in that I used a little less sugar, used set Greek yoghurt instead of regular natural yoghurt, because that’s what I had, and omitted the flaked almonds (which should be sprinkled on top) only because I didn’t have any. I did wait for 15 minutes for it to cool slightly before releasing it from the tin (as instructed) but the smell was so divine that I just had to cut a slice and try it while it was still warm from the oven. It looks quite stodgy and maybe even undercooked in the photo but it wasn’t – it was surprisingly light. (I didn’t eat all that by myself by the way.) This is Seriously Good Cake and it would also make a wonderful pudding. 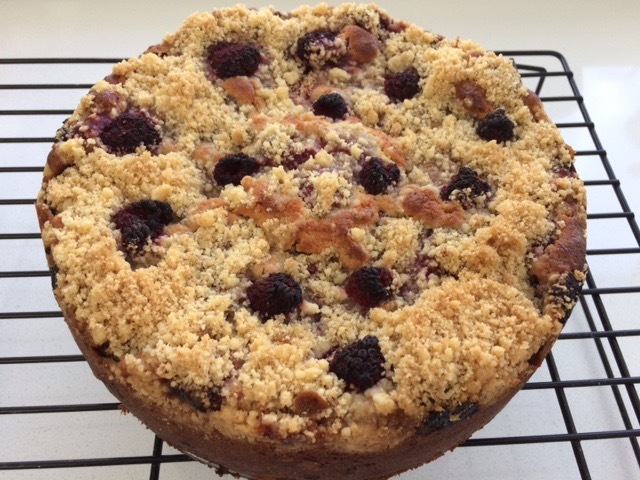 As well as this cake, I also made two banana loaf cakes (recipe here) and a huge apple and blackberry pie – all in an effort to use up the fruit mountain that occurs at this time of year. I’m missing my sous chef, though, and she’ll be cross she missed a mega-baking day but we do have a big party to cook for soon, so there will be plenty more baking going on next week. Bang goes my waistline. Good luck to any of you whose children collect A or AS level results today. My eldest took one AS level (these are exams taken half way through an A-level course; exams for his other two subjects are all at the end of the two years) and he’s off to school soon to collect the result. Fingers crossed. The colors in that cake are just beautiful. It looks delicious too. I hope your son finds good results today! Good luck to him. Mmmm looks good. 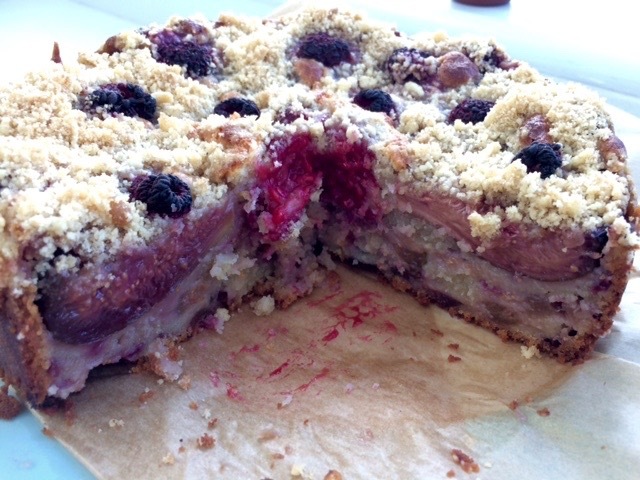 Fig and raspberries aren’t a combination I would have put together so definitely one to try. Currently eating greegages by the greedy bowlful and very thankful that my offspring are past the results day stage. I would literally walk all the way to yours to eat a slice of this cake – if I was sure there was any left. I love figs. You could dry some for the winter if the tree is still bearing fruit. Dried figs are amazing. My great uncle in Italy got injured when he fell of a large fig tree, harvesting. Sorry, that’s a bit random. No fruit mountain here, sadly. Blackberries are not ready, nor are the stone fruit. I love freash figs and raspberrys, if I lived closer I would be thinking of an excuse to visit. Please your son did well. A cake to celebrate your son’s results! Looks delish! That does look gorgeous! I have a fig tree that produces delicious figs but only one or two at a time, and I’m afraid they never make it as far as the kitchen…. Hope the exam results went well! Looks lovely … and you are so lucky to get those figs! Looks like I’ve got one (yes one) ripening this year. Oh, I’m drooling! Also sending a link to Judy. I’m crossing my fingers that I’ll be back here searching for this recipe next year. We have about two dozen figs on our tree this year which we have happily been eating just as they come. I’m not sure that I have ever eaten a cake made from fresh figs but this one looks amazing. Huge Congratulations to your Eldest on his exams. We have a happy boy in this house who, as of 7AM this morning, is officially going to college. Phew! That’s great news – a big well done to your boy. Huge relief when it all comes together, isn’t it?! Oh my goodness, this looks divine. I am crazy about figs I can’t think why I don’t have a tree. Do you think it would be nice just with raspberries? I’m sure it would but the fig/raspberry combo is particularly wonderful. If you lived closer, I’d bring some round! 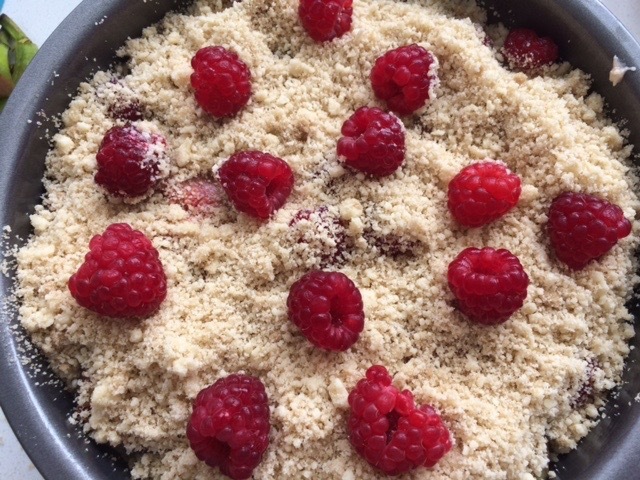 That would be lovely and not just for the crumble. The cake looks divine. I have been baking zucchini/courgette muffins with blackberries to use up our abundance and we are freezing fruit and veggies like mad. I’m happy to hear that your son did so well on his exams. Not having something similar over here, I can only imagine what a trying time it must be to wait on the results (not to mention all the studying). It’s that time of year when I wish we had a larger freezer! Yes, waiting for results is not fun for anyone. Thankfully his result was worth waiting for.